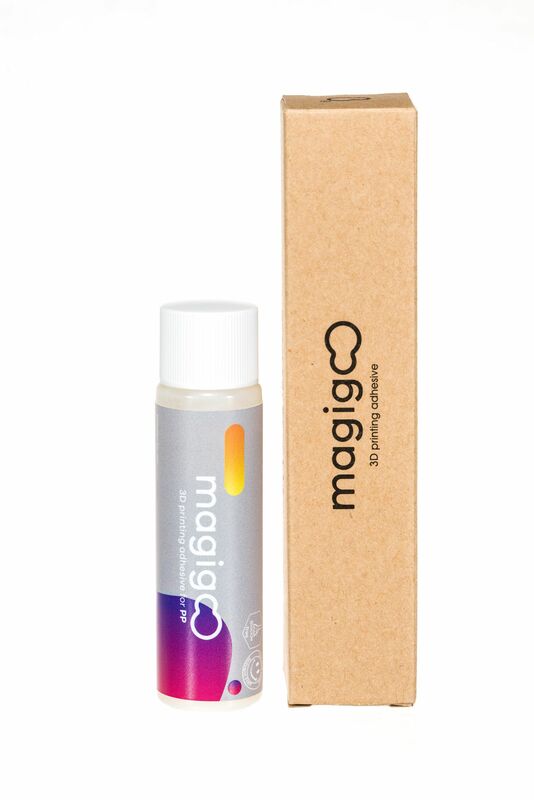 WHAT: MAGIGOO PP is designed for professional use, to work exclusively with polypropylene filaments. The part should be relatively easy to remove once it cools and the glue residue should also be easily cleaned off if the included procedure is followed. Polypropylene (PP) is a thermoplastic semi-crystalline polymer exhibiting properties of good impact resistance and ductility. 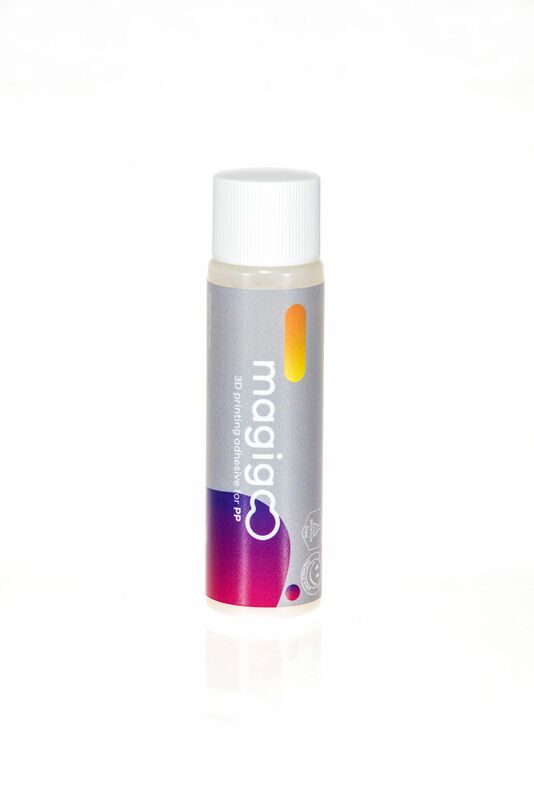 It also has a relatively non-polar molecular structure which makes it chemical resistant and thus ideal for use in food packaging and medical equipment. It is in fact well known in the adhesive industry that it is difficult to adhere polyolefin materials to other types of materials. This combined by the partial crystallinity makes it an especially hard material to print with. 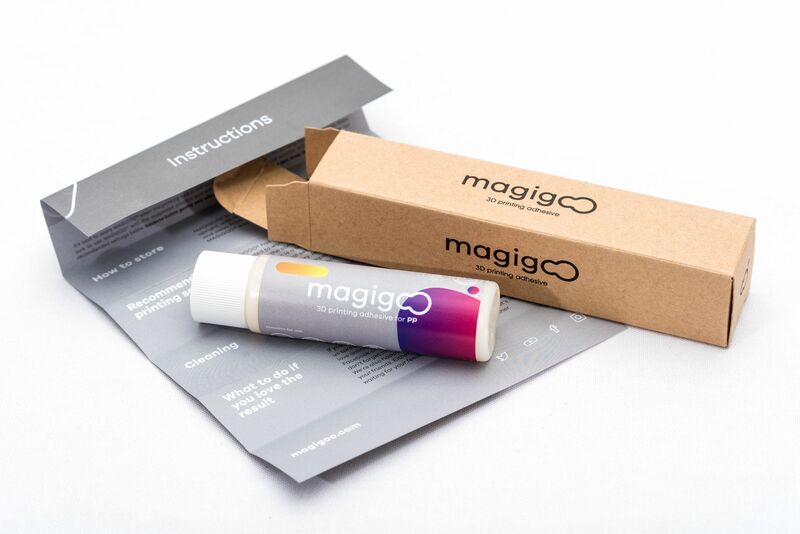 Magigoo PP solves this issue and provides additional convenience for use in FDM 3D Printing. 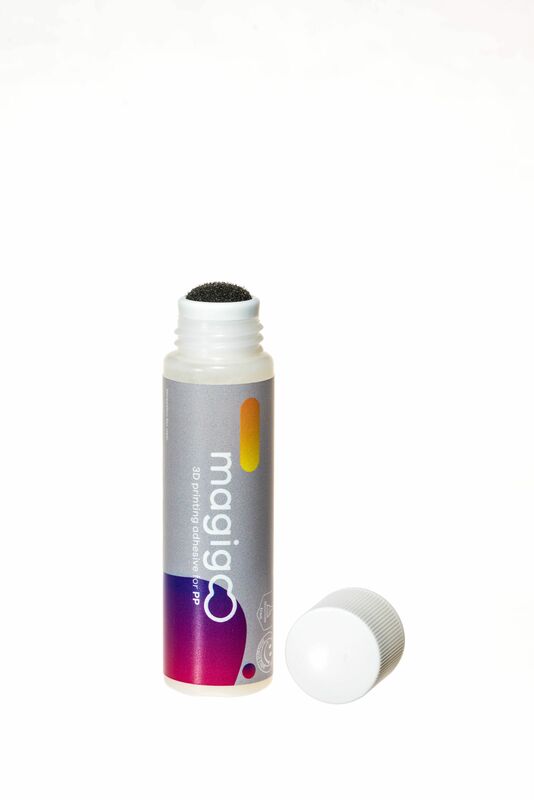 MAGIGOO PP has been designed and tested to work with different PP filament brands. Apply to the desired area by pressing the nib on the bed (activating the inner valve) and spreading as needed. Allow to cool and Remove – The Part should become easier to remove after sufﬁcient cooling. If the part is hard to remove, a scraper should be used to assist part removal. Clean - Use a wet hard sponge to remove all glue residue. Once the glue layer is wet it will form a white layer which can be easily scrubbed off with an abrasive sponge. Once the layer is completely loose from the glass it can be wiped away with a wet cloth and ﬁnally cleaned with a dry paper towel. This adhesive is for professional use. Contact with eyes causes serious eye damage, Wash hands and exposed skin thoroughly after handling.